The SALT Festival is proud to present, a night in the stars with Paul Curnow, an internationally renowned astronomer and leading authority on the Aboriginal Night sky. Australia has been occupied by humans for at least 45,000 years and possibly as long as around 60,000 years, over this time Aboriginal Australians have accumulated a detailed knowledge of the heavens above. In this talk, I will give an introduction to Australian Aboriginal cultures and how their view of the night sky differs from the contemporary western view. Night sky stories of the northern hemisphere are very familiar to many people, however the stories that are indigenous to the southern skies are less well known. Explore how knowledge of the night sky has been passed on through oral narration; dance; and artistic interpretation; in addition to the diversity in the way the stars and constellations are viewed by different groups. 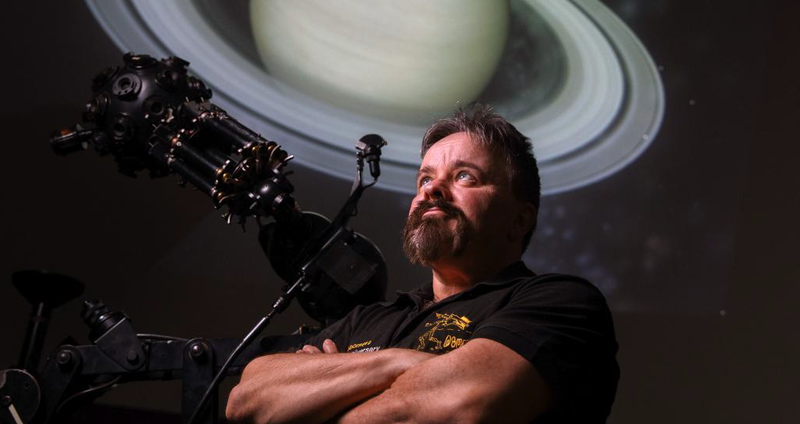 Paul Curnow [B.ED] has been a lecturer at the Adelaide Planetarium since 1992. He was the recipient of the ASSA editor’s award for 2000; 2010; and then again in 2013. In 2002, he served as a southern sky specialist for visiting U.S. and British astronomers who were in Australia for the total solar eclipse. After 27-years of research, he is regarded as one of the world’s leading authorities on Australian Aboriginal night sky knowledge; and in 2004, he worked in conjunction with the Lake Erie Nature and Science Center Planetarium in Ohio, on the creation of a show that features Indigenous Australian stories of the night sky. In addition, Paul runs a number of popular courses for the general public that focus on the constellations, planetary astronomy, historical astronomy and ethnoastronomy, which primarily deals with how the night sky is seen by non-western cultures. He appeared as the keynote speaker at the inaugural 2010 Lake Tyrrell Star Party in Sea Lake, Victoria and in 2011 was a special guest speaker at the Carter Observatory in Wellington, New Zealand. Since 2012 Paul has taken the role of Lecturer for the Astronomy & Universe course (EDUC2066) for the School of Education at the University of South Australia. Moreover, in 2018, he was made an Honorary Life Member of the Astronomical Society of South Australia for his contributions to astronomy. Paul appears regularly in the media and has authored over 50 articles on astronomy.